The Loyola University New Orleans Documentary and Oral History Studio will bring to life how one of New Orleans’ most celebrated eateries—Dooky Chase’s Restaurant—played a pivotal role in the Crescent City’s music, culture, civil rights and food scene in a free, public event Tuesday, Oct. 29. The event showcases exclusive documentary interviews conducted by Loyola students with the restaurant’s former employees to illustrate life in New Orleans’ fifth, sixth and seventh wards in the years before desegregation. The interactive event features Edgar Chase III ’71, J.D. 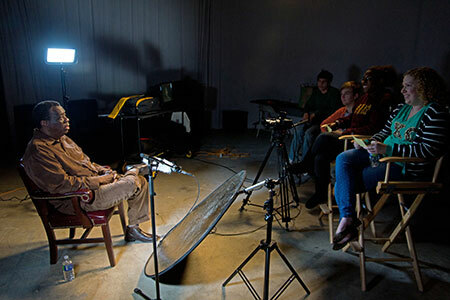 ’83, Loyola history professor Justin Nystrom, Ph.D., and the Loyola students who have been actively involved in the filming and editing of the interviews. “A Haven for All of Us: Stories from Dooky Chase’s 1941-1970” is set for 7:30 p.m. in Miller Hall, room 114 on Loyola’s main campus. The former employees who worked during the restaurant’s beginnings in the 1940s and 1950s share stories focusing on more than just the famed food they were serving up. Through the interviews, students uncovered little known gems about the Civil Rights movement, the African-American community, the city’s music scene, as well as its famous food culture. The former employees told stories of meeting celebrities at the restaurant such as professional boxer Muhammad Ali and hosting political leaders of the Civil Rights movement in secret meetings in the restaurant's upstairs. The interviewees also spoke of how important events such as desegregation and the construction of Interstate 10 through the Claiborne Avenue corridor changed life in the restaurant's sixth ward neighborhood. “When I realized that I was going to get to help preserve … this little piece of history that came along with New Orleans, I felt really privileged,” said Brittany Trosclair, a Loyola student who helped with the project. The event is sponsored by the Loyola Department of History, the Documentary and Oral History Studio and the Center for the Study of New Orleans. To schedule media interviews, contact Mikel Pak, Loyola’s associate director of public affairs.